Blowtorch - From the Kitchen Craft Colour Works Collection. 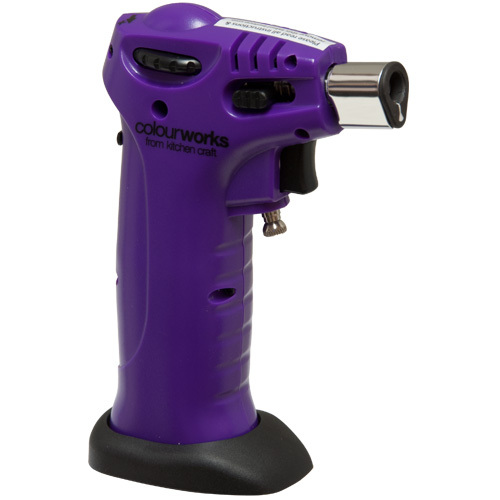 These blowtorches are supplied to us in various colours. please do not base your purchase on the image supplied on our web site. Take care when removing product from packaging. Wipe clean only. Always follow the full care and use leaflet enclosed. 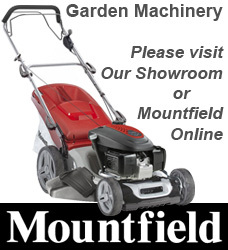 Guarantee: This product is guaranteed against faulty workmanship or materials for a period of 12 months from the date of purchase providing that the care and use instructions are followed. The guarantee does not cover defects occuring due to abuse. This does not affect your statutary rights. In the unlikely event that a fault should occur, to claim under this guarantee return this itrem to the store from which you purchased it, together with the purchase reciept. Filling the torch: Always follow butane gas canister instructions. Use only high quality butane gas, specifically refined for Blowtorches. We recommend Kitchen Craft butane gas. Fill only in a well-ventilated area (preferably outdoors). Make sure the flame control valve is fully set to the"-" position (Fig. 2). Turn the unit upside down and insert fill stem into fill valve and press down for 3 to 4 seconds. Repeat three times. Back spray from fill valve indicates that appliance is full. After filling, allow a few minutes for gas to stabilise. DO NOT ADD ATTACHMENTS TO THE END OF THE GAS REFILL CANISTER AS THE VALVE IS DESIGNED TO ACCEPT THE GAS DIRECT FROM THE GAS CAN WITHOUT ANY ADAPTORS ADDED. (THESE ADAPTORS ARE ONLY USUALLY PROVIDED FOR CIGARETTE LIGHTERS). Igniting: Turn the flame control valve anti clockwise 2/3rds to the "+" position. Pull the safety pin down, gas will exit the burner head with a 'hiss'. At the same time pull the igniter trigger button, the blue flame will ignite instantly. lt is advised to operate and light with the air supply control as far back as possible. (If torch does not light, then press ignition trigger button again. H torch still does not light, check and make sure that the air control collar doesn't cover the vent hole: Turn the gas off using -/ + valve. Hold torch at an angle so that you can see inside the front of the burner. With the fuel shut off, press the ignition button. A spark should jump from the ignition pin to the inner face of the burner. If spark jumps, repeat lighting procedure. If torch still does not light, try lighting after turning on 1/2 and 3/8 turn. WHEN YOU I E I GO OF THE TRIGGER, THE BLOWTORCH WILL GO OUT AND BE LOCKED AUTOMATICALLY. Flame adjustment: Adjust the flame length during use by turning the flame control valve to approx. 10-25mm (1/2" to 1"). Don't make the flames too long as it will only waste the gas and make the flame unstable. Adjust the flame length by using the flame control valve. Changing the flame from blue to a less hot and less powerful orange is done by moving the air supply control forward (the blowtorch will not light in this position). Gas container capacity: 15cc. 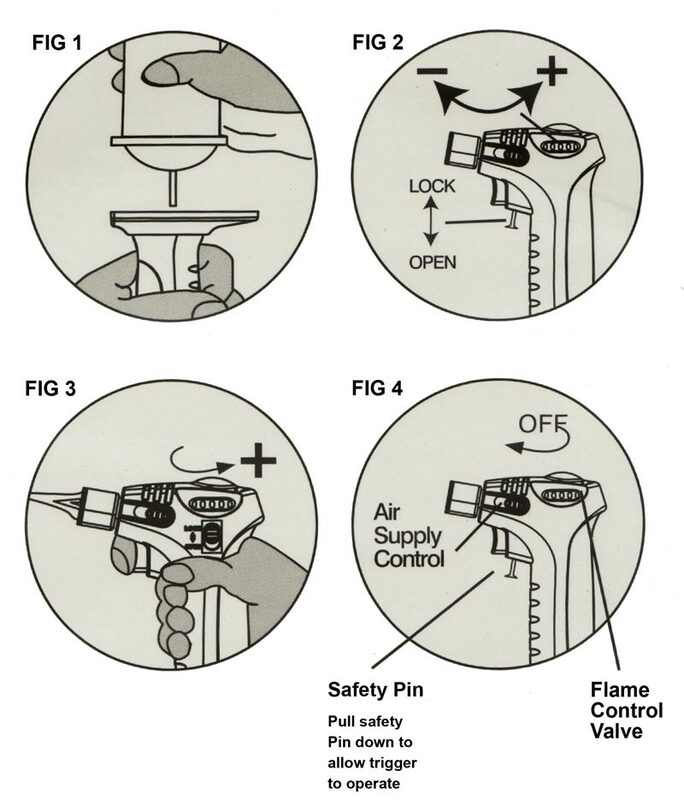 Turning off: Turn the flame control valve clockwise until flame is shut off (Fig. 4). For storage protection, be sure flame is out and torch is cool. Wipe clean only.